Who hit the ‘pause’ button? Who hit the ‘pause’ button? I think our veggies have jet lag! But hang with us, they’re growing and putting on flowers and fruit and we should be harvesting shortly. NOW FOR THE GOOD NEWS!!! We’ll have fresh, locally-grown PEACHES AND CREAM SWEET CORN for sale within the next 10 days. Pre-Order your corn now at $5.00 per dozen for pickup at our E. Union Grove Road location. We’ll notify you when the corn is ready to be harvested so you can arrange to come to the farm and pick up your order on the same day we pick your corn. There’s nothing like fresh picked sweet corn, just off the stalk. Go to http://dixiechileranch.com/You-Click_We-Pick.html#Purchase to purchase your sweet corn. Cut uncooked corn from cob, scraping cob to remove pulp. Combine corn and sugar. Chill 1 hour. Melt butter in saucepan over medium heat. Add corn. Cook 1 minute. Stir in pepper. Gradually add whipping cream, stirring constantly. Cook uncovered over medium heat for 10-12 minutes or until liquid is absorbed, stirring corn frequently. Stir in salt. Pre-heat oven to 425 degrees. Grease two 9” square baking pans. Mix all dry ingredients together (stir with large spoon 30 to 40 times). Mix eggs, milk and oil together; then mix well into the dry ingredients. Add creamed corn, chopped chiles, onions and grated cheese. Stir so entire mixture is well-mixed.Pour cornbread mixture into the two greased baking pans. Bake 30 minutes in 424 degree oven, or until a toothpick stuck in the middle comes out clean. – Serves 8 to 10 people. Diego, the Dixie Chile Ranch Cowboy here. Well, my friends, we’re still waiting for our vegetables to be ready to harvest. But I can tell you, we’re closer than we were last week. 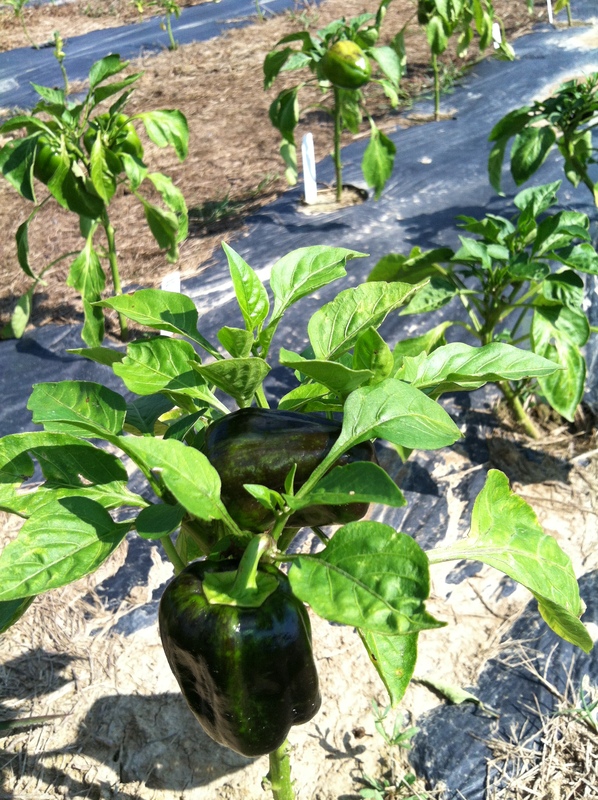 We actually have tomatoes, cucumbers, chiles and peppers on our plants – and getting bigger every day. So the time is growing closer when your fresh, locally-grown vegetables will be ready for picking and purchase. Other news: We’re planning a wine tasting and chile roast in early August. There will be a limit of 25 guests (a state law), so when you receive an invitation, you’ll need to RVSP very quickly to insure your place in the festivities! More on this later as we firm up the date with the wine folks. Since we haven’t any produce to harvest just yet, here’s another recipe using the items we grow. This one will have your tastebuds in a state of anticipation. Chop chiles, garlic and pimientos very fine; mix well. Add chile sauce and salad dressing; mix all ingredients together very well. Refrigerate for at least one hour or until well chilled. Store in the refrigerator between uses. Serve on green salads, use as a veggie dip, or as a condiment on hot dogs and hamburgers. Diego, the Dixie Chile Ranch Cowboy here. The summer is upon us at the Dixie Chile Ranch. The heat is on its way with expected highs in the high 90’s by next week. We’re watering, weeding and feeding all the varieties of produce we have growing. Slow progress is being made to the point when our first chiles, tomatoes and bell peppers, cucumbers, eggplant and squash will be ready for harvest. It’s interesting how last year at this time with half the rain but much warmer days, we were in full swing harvesting and selling our vegetables. This year with the late start to the growing season we’re a good three weeks behind last year … but hang in there; our fresh produce is coming – soon. In the meantime, here’s an Anaheim chile recipe to save for (and savor) when our first batch of chile is available. Wrap each cheese cube with a chile strip, secure with cocktail toothpicks. Refrigerate until needed. Combine oil and salt in deep fryer and heat slowly until a one-inch cube of bread browns in 40 to 60 seconds (350 degrees). While oil is heating, make the pancake batter by mixing the water and the pancake mix together; beat until smooth. Roll the chile cheese bits in the batter, then drop in the hot oil until golden brown. Remove and drain. Serve with taco sauce, Chile Con Queso sauce or Guacamole. Enjoy! Diego here, buenos dias, to all of our You Click-We Pick folks! As I’m sure everyone is aware, this growing season is continuing to be unique with all the weather challenges we’ve faced. 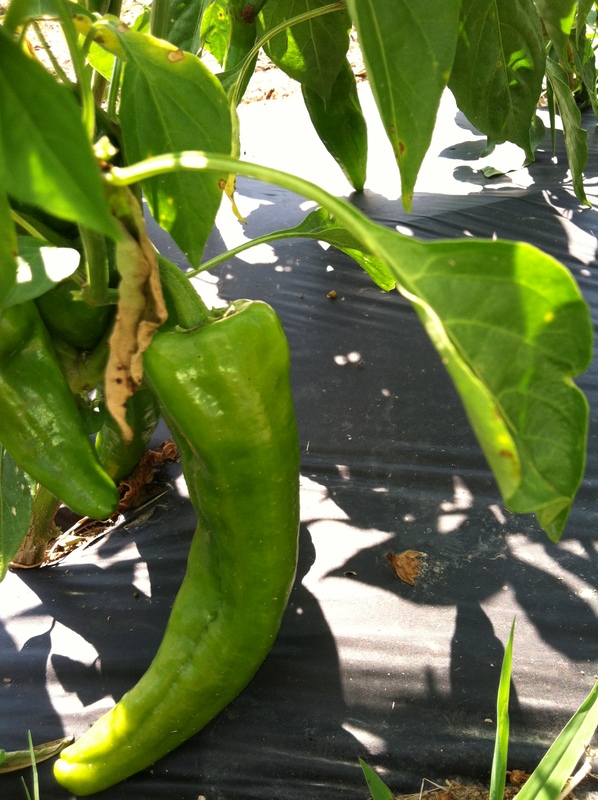 We want you to know we’ve been planting multiple varieties of produce for this 2013 summer season. We’ll start sending weekly updates each Monday throughout the rest of summer and what we have available to harvest each week. We’re about two to three weeks from having anything to harvest. Please bear with us. Please feel free to contact us if you have any special requests or needs in locally grown fresh produce.